San Diego’s Democratic congressional leaders praised the bipartisan language in President Trump’s State of the Union address, but said he was “out of touch” in his continued emphasis on building a border wall. “President Trump tried to offer a message of bipartisanship and unity. That’s great to hear, but actions speak louder than words,” said Rep. Scott Peters, who represents the 52nd District in coastal San Diego County. 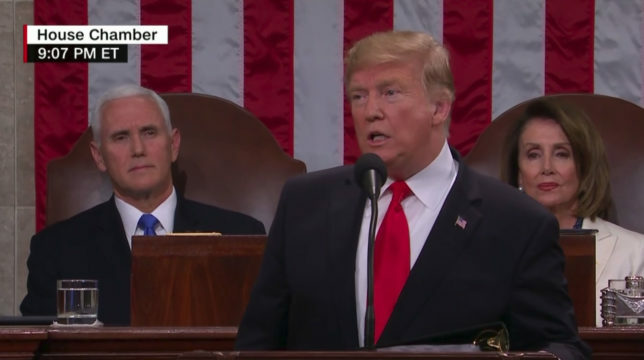 “In his speech, the President said that San Diego’s border wall has almost entirely stopped illegal immigration. It was not until 9/11 security procedures were implemented that the real decline began,” said Peters. “Continued bickering about applying an archaic wall as the singular solution to the entire U.S.-Mexico border is foolish,” he added. “While I am hopeful that the president’s calls for bipartisanship were made in good faith, the substance of his address was woefully out of touch with the current state of our union,” said Levin, who was elected in November to represent the 49th District in north coastal San Diego and south Orange counties. Rep. Susan Davis echoed Levin’s assessment that the President’s message was out of touch with the concerns of Californians. “If you are a middle-class family hoping to hear how the President plans to work with Congress to raise wages, lower health care costs, and clean up Washington corruption then you didn’t hear much to cheer about in the speech,” said Davis, who represents the 53rd District in central San Diego County. “While there are a few areas of agreement on which I would be willing to work with the President, he has yet to demonstrate the leadership skills necessary to make them a reality,” she said.